Lahore is the city of fountains. Well, that’s what history says. Except traffic, walls purged with advertisements of Bengali Babas and ‘Peshab karna manna hai,’ there are not many pleasant sight views to behold down the pedestrian paths. A gradual but substantial process of making the Lahore city multi-hued has come about. One rarely drives through Lahore without seeing different expressions of art and abstract. 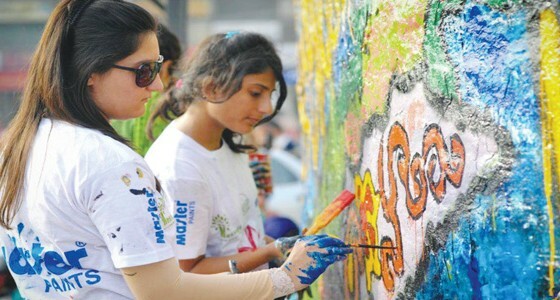 Occupying many walls throughout the already vibrant city of Lahore, the Street Art Competition has now spread its colors to Multan, Faisalabad, Rawalpindi and Gujranwala. Initiated by Message Welfare Trust, the Street Art Competition gives the youth a chance to put in their part in beautifying their respective city. They also get an opportunity to define their thoughts and expressions through colors and not to forget the incentive of a fun filled time with friends. Initiated early this year in March, the series of SAC has been scattering colors all over Lahore, travelling all the way to Multan, Gujranwala and Rawalpindi. Recently, more than 200 students from various education institutes participated in SAC. Armed with their expertise and raw talent of drawing and painting. 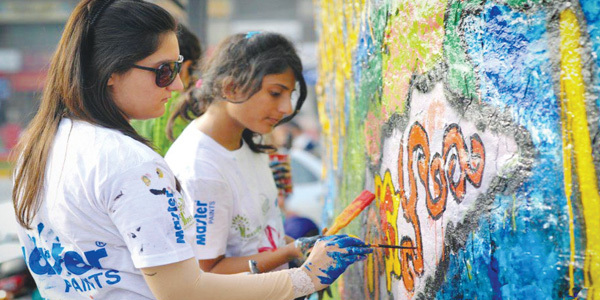 50 walls of Rawalpindi were tinted with meticulous designs painted by the youth of Rawalpindi. With Pakistan and its beauty as the theme of the activity, the students of Rawalpindi presented their love Pakistan’s beauty and heritage through their creativity and paints. They walked through undiscovered terrains of their talents. Historical monuments and natural landmarks of Pakistan were painted. Those with the flair elaborate amusing graffiti on the large brick canvas. With a vision of a better future, Master Paints both supports and supplies this anti wall chalking campaign as it gives people a break from the advertisement infested walls. Making the concept of talking walls as their foundation, SAC and Master Paints make their statement of a cleaner environment by inviting people to create from themselves a favourable surrounding. The thought of talking walls is talking about the beauty, culture, art and traditions of our country. It also encourages the art activities among the youth. Every talking wall depicts a story-a story that tells you something about the artist, a bit about the theme of the competition, a little about the colors and most importantly, it reminds us, the citizens of Pakistan, how our cup has been filled up to the brim with blessings in the shape of our country, and how we choose to ignore it instead of cherishing it. As Paulo Coehlo says, every blessing neglected becomes a curse, SAC says every colour and the slightest glimpse of beauty ignored makes it blight. Master Paints supports as well as sponsors SAC and offers the most vivid of hues and the most brilliant of shades of colour, pushing people to bring about beauty with colour to their city.